Welcome to Carolina Sunrise, freshly painted with all new high end furnishings. From the new mattresses and box springs to the new couches, you'll feel like you're in a luxury resort. There is nothing like sitting out on your deck in an ocean front condo. We have easy access to our beautiful white sandy beach, just steps away. You can watch the dolphins play and the pelicans soar. If you are an early riser you can have your coffee while the sun rises over the ocean. The Kitchen is fully equipped and has stainless appliances, granite counter tops, and a tile black splash. With an open floor plan you can be in the kitchen and still enjoy the ocean view. The dining area has a table and four chairs plus three barstools at the kitchen counter. The living room has plenty of seating and a large flat screen tv with cable, DVD player, and wifi. The master bedroom has a king size bed, flat screen tv with cable, and ceiling fan. The on suite master bathroom has a gorgeous tiled shower. The second bedroom has a queen size bed, hardwood floors, flat screen smart tv, ceiling fan, and shares the hall bathroom. We also have a full size washer and dryer, elevator, large outdoor pool, gazebo, and picnic area with grill. Our beach access walkway is next to the pool and has an outdoor shower to rinse off the beach sand. The Ocean Grill restaurant and Tiki Bar is right next door and for breakfast don't forget to check out Granny's Country Kitchen just across the street. What a perfect place to relax and enjoy the summer. You can stroll along the beach to the boardwalk area and get yourselves a delicious donut at Britts Donut Shop or a slice of pizza at Frank's Pizza. So much to do during the summer: live bands and fireworks on Thursday nights and plenty of local restaurants to choose fromt. If you get a bit too sunburned and need a day out of the sun don't forget the NC Aquarium right down the road at Kure Beach. It's air conditioned and if you go on Wednesdays you can watch them feed the alligators! Taking your vacation at Carolina Sunrise will provide you with some great memories for years to come. We hope to see you year after year. 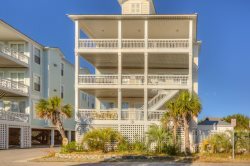 Carolina Beach is a perfect beach location and you'll be impressed with our condo. Don't wait, call us today to book your reservation (910)-409-6687. You'll be glad you did. Location was perfect! Condo was clean and beautifully decorated! Booking was easy and we liked that we didn't have to pick up a key, especially since we got in so late. The A1 team rocks! Elevator, great view, comfortable beds and we appreciated the Keurig.